Today at Lamacchia Realty’s 2019 Kickoff Event Anthony Lamacchia announced a “Coming Soon” product to add to its already extensive suite of marketing services the company offers to its agents. This service will enable Realtors to advertise their listings on the company’s Facebook and Zillow pages as “Coming Soon” listings. This program was thought of and created by Dave Karoly, a Lamacchia veteran who is the company’s Sales Manager. Once signed up, agents can now submit their listings into the marketing services department, and the listings will be posted within 24 hours that the property’s picture is obtained either through pre-list or taken by the agent. All leads will be routed straight to the agent within the Lamacchia’ s CRM. Testing has been going on since mid-fall and it has produced the results the agents were looking for; more buyer leads at a lower cost and, most importantly, happier sellers! “I love this! Just another way we assist agents in creating their own leads. Dave came up with this, tested it and I am excited that we are now implementing it in time for the spring market. Ads will begin being posted by next week and our agents are very excited,” said Anthony Lamacchia Broker/Owner. Lamacchia Realty continues to put their agents first, offering value-based products, services and tools to help their agents succeed. In August, Lamacchia launched a marketing services program for agents and it has been a huge success. That program unleashes the same marketing gurus that have built Lamacchia’s social presence onto agent’s social and sphere mailers. There are currently over 30 Lamacchia Realtors enrolled in this service. 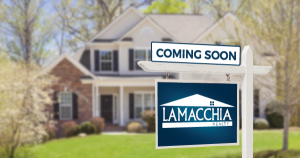 These Coming Soon ads leverage the power of Lamacchia’s Company social media pages; the largest and most effective Facebook business page of any Real Estate Brokerage in New England and the largest, highly recognized Zillow page. This new program will enable agents to utilize this audience to their advantage by marketing to their buyers and creating additional demand even before the home is listed. To learn more about what is offered to Lamacchia Realty Agents click here.